FCPC launched! A step forward for professional chemists in Canada. 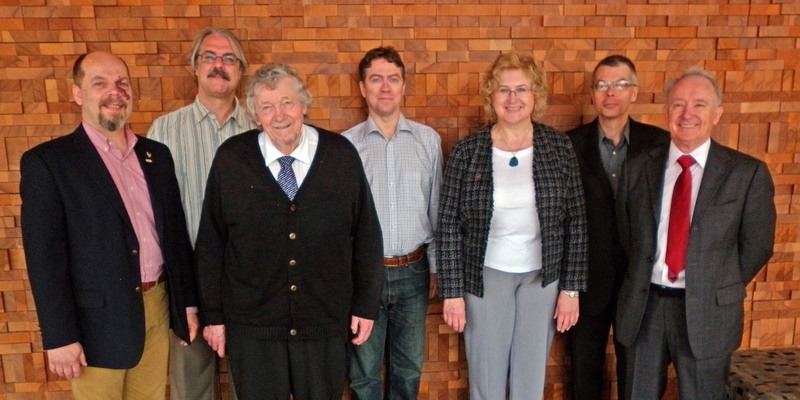 On June 1 at the Canadian Chemistry Conference and Exhibition in Vancouver, the Professional Chemistry associations of British Columbia (ACPBC), Alberta (ACPO), Saskatchewan (ACPS), Ontario (ACPO), Quebec (OCQ) and Nova Scotia (NSCS) created a new national body called the Federation of Canada’s Professional Chemists /Fédération des Chimistes Professionnels du Canada (FCPC). 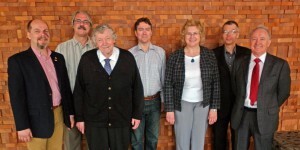 Representatives of the founding organizations of the FCPC (l to r): Terry Obal, ACPO; Colin Campbell, ACPS; Paul West, ACPBC; Stephen Urquart, ACPS, Kathy Janzen, ACPA; Chris Swyngedouw, ACPA; Guy Collin OCQ. Not shown, but electronically present: Jim Frazee, NSCS. Paul West (President, ACPBC) was elected FCPC Chair, Guy Collin (Président du Conseil d’administration OCQ) was elected as Vice-Chair, and Cathy Janzen (Exceutive Director, ACPA) was elected Scertary-Treasurer. Following the founding meeting on June 2, Paul West on behalf of the FCPC signed a Mutual Recognition Agreement (MRA) with the Canadian Society for Chemistry (CSC). Lorenzo Ferrari, CSC President (2013-2014) was the CSC signatory. These are two significant steps forward for Professional Chemists. More comments on the FCPC and its role in enhancing the chemical profession are available on the CSC website. This was a great opportunity to examine all aspects of “what it means to be a professional” . The ACPBC has developed an arrangement with our ACPA colleagues in Alberta to deliver their well- received professional ethics course. This is a one-day small group workshop that has something of value for all chemical professionals. Stay tuned for the next course offering in Fall 2014. Visit the ACPBC Booth at the CSC! The 97th Canadian Chemistry Conference and Exhibition will be held in Vancouver this year, June 1-5, 2014. The conference theme is “Chemistry from Sea to Sky” and attracts over 2500 delegates in academia, industry and government from across Canada and around the world in all areas of Chemistry. More information on this conference is available at www.csc2014.ca/about/welcome.html. This year, we are pleased to sponsor the Environment Division of the Chemical Institute of Canada, which has assembled a strong technical program at this conference including symposia on Environmental Mass Spectrometry, The Chemistry of Sea and Sky, Chemicals of Emerging Concern (joint with the American Chemical Society), Environmental Chemistry in the Oil Sands, Metals & Metalloids in the Environment and Current Topics in Environmental Chemistry. We hope that you will join us at CSC2014 in Vancouver and visit the ACPBC Information Booth on the exhibition floor. It is official: ACPBC granted exclusive RIGHT to Title for the Professional Chemist (PChem) and Chemist-in-Training (CIT) designations! ACPBC inclusion in CSAP bylaws as a parent organization was approved at the CSAP AGM on June 16th, 2011. These bylaw changes have been endorsed by the Ministry of the Environment, and the CSAP bylaw changes have been accepted by the BC Registrar of Societies.